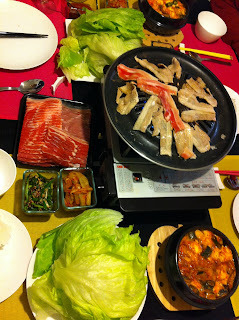 The Frenchman's Food & Wine Blog: Home-cooked Korean barbecue ... and a healthier bacon alternative! 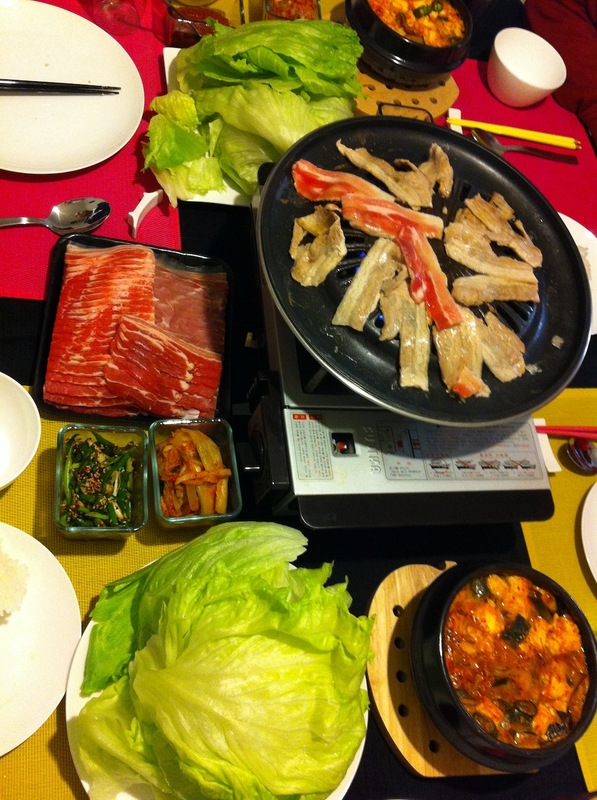 Home-cooked Korean barbecue ... and a healthier bacon alternative! One of my oldest good mates Eujio had the boys over for a home cooked dinner a few nights ago. Eujio (or Euj) has always been an excellent cook, specialising in Asian dishes. But since he's about to marry a Korean girl, he has been gradually transformed by his in-laws- and wife-to-be into a good Korean boy (or at least as close as they can get him there). This includes a new haircut, slightly preppy clothing (compared to his previous edgy style), the ability to spit out Korean words for random things, an appreciation of Far East Movement and a jumbled political view (not Korean-related, but simply his right versus her left - must make for very interesting dinner conversation). It's certainly clear who wears the pants here. There is at least one upside to Eujio's reverse taming of the shrew transformation - he's now learnt to do a good Korean barbecue. Now you might ask, what skill do you really need to cook Korean barbecue, apart from going out and buying the table-top gas-fired barbecue hot-plate cooker? My answer is: Lots. Proper Korean barbecue is not merely about slapping slivers of meat on the hot plate. It's also about the side dishes, as you can see from the photo. The spicy hot soup with prawns, mushrooms, veges and tofu (not sure what it's called, but it's deliciously rich), the chopped spring onions in some kind of soy and sesame oil sauce with sesame seeds, the moist, slightly sticky rice (hey it's Korean style), the lettuce, the fermented red bean paste (delicious) and of course, the kim chee. This kim chee was not just any kim chee. This was homemade by Eujio's Korean mother-in-law to be, to an ancient family recipe handed down through the generations; Euj receives a monthly stipend in a big tub (probably an advance on the dowry). Man this is some tasty kim chee (speak it like Pitt from Pulp Fiction while he was eating the Big Kahuna burger, and you'll feel what I'm sayin'), sporting an unexpectedly subtle aroma and flavour. Why the lettuce leaves? Well, apparently Koreans traditionally eat their barbecue in a manner akin to sang choy bau. Nestle a lettuce leaf in the palm of your hand and spread some red bean paste on it. Then add rice, spring onion condiment and even kim chee, before laying one or two slivers of barbecued meat over the top. Wrap, put in mouth, bite and savour the flavour! For those of you who like to cook stuff in fat, Korean barbecue is great fun. The fat run-off from the meat pools in the drain around the outer perimeter of the barbecue plate, and you can confit pretty much everything in it, from mushrooms to meat. What a fantastic meal, all made from scratch by Euj (or so he claims), except for the kim chee, of course - he's not Korean enough ... yet. In addition to a great evening of delicious food and hanging out with old mates, talking crap and sparking intense yet meaningless debates by deliberately pushing each other's buttons on politics, religion (such as climate change) and sport, I actually had an epiphany: the thinly sliced pork belly would make an absolutely delicious and healthy substitute for bacon! It's essentially the same thing, only fresher and cut into smaller slices. And healthier too (you probably don't hear many people claiming that bacon is healthy, but give me natural animal fat anytime over processed saturated fats! ), because it hasn't been thoroughly soaked in sodium nitrate and sodium nitrite like traditional bacon. Yes, there is a good reason for the use of nitrates and nitrites in cured meats like bacon - to kill botulism spores before they kill you dead (albeit without wrinkles). And of course, it also preserves the meat which allows it to sit safely on the supermarket shelf for months, and then allows you to keep it in your fridge for a week or so while you gradually eat your way through the pack of bacon. The problem however arises from the risk that these compounds will break down into nitrosamine (which is scientifically proven to be a human carcinogen that increases the risk of colorectal cancer). Alright, enough preaching. I have been searching for a viable alternative for a long time, and I've finally found it. It smells like bacon and tastes like bacon, and I don't need to roll the nitrosamine dice. 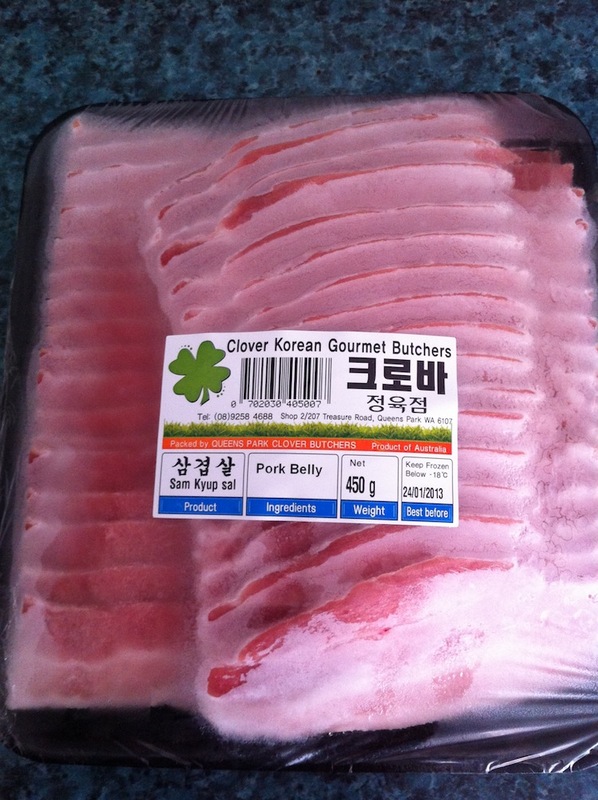 As of today, I've bought myself a pack of pork belly sliced up Korean barbecue style, separated them into individual serves in ziploc bags, and stuck them all in the freezer, ready to whip out for brekkie or anytime I need a bacon fix! 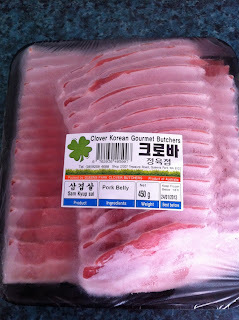 If you too are interested in a healthier variety of bacon, you can find a Korean deli in the Centro Victoria Park Shopping Centre which sits in between Albany Highway and Shepperton Road in Vic Park, just across the road (Duncan Street) from the Victoria Park Australia Post Office. It's not the cheapest meat at around $22 a kilo, but it's perfectly pre-cut into mini slices of fresh, non-nitrate/nitrite treated bacon! Try it out yourself and tell me what you think by posting your responses here!